MBLAQ‘s Lee Joon revealed that he does not like to spend money. On the April 10th episode of KBS 2TV‘s ‘1 vs 100‘, Lee Joon opened up about his frugal nature. Also guest-featuring on the episode was Shinsadong Tiger. MBLAQ member G.O. showed off his culinary skills on ‘Hello Baby’. On the March 29th episode of KBS Joy‘s ‘Hello Baby’, the MBLAQ boys prepared a surprise party for baby Dayoung‘s birthday. G.O., who was determined to learn how to cook for the children before the show began, kept his promise by preparing a special Vietnamese meal for Dayoung. 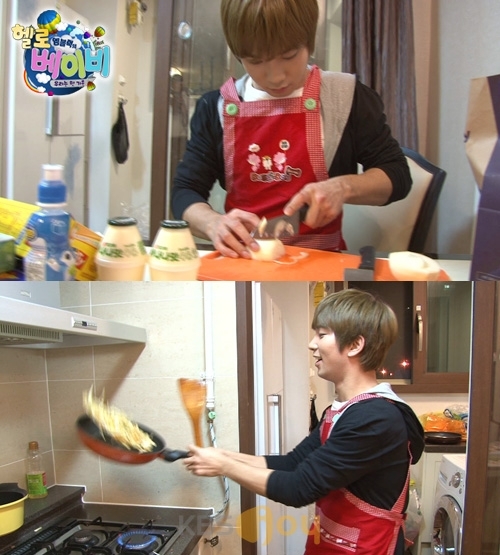 He impressed the rest of the MBLAQ members as he confidently cut up vegetables, stir-fried, and even danced while cooking in the kitchen. Unfortunately, all his skills aside, G.O. still seems to be an amateur. Mir took a bite of G.O.’s finished product only to spit the food right back out, proving that G.O. may need some more practice when it comes to cooking. Meanwhile on the same episode, Lee Joon showcased his explosive ‘aegyo’ on the series. Check out the cuts from the episode below! MBLAQ’s Lee Joon & Jung Juri the 1st couple born on ‘Endless Dream’? 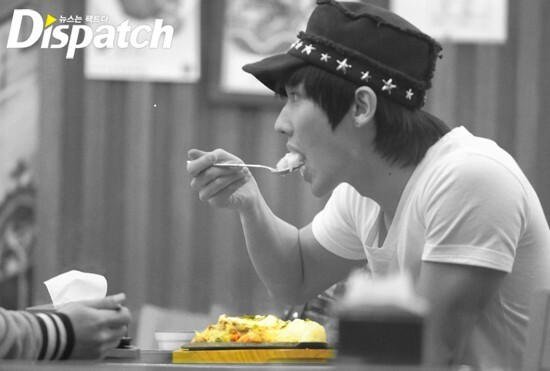 MBLAQ‘s Lee Joon and comedian Jung Juri have developed a romantic-like feel. The two were recently on MBC‘s ‘Our Sunday Night‘s new corner ‘Endless Dream’ and displayed their great variety show skills. What was especially funny in this episode was when Jung Juri said to Lee Joon, “The standard for Korean women is me” and continued to try to flirt with him. Jung Juri has often expressed her interest in Lee Joon on variety shows and these two just might become the first couple born on ‘Endless Dream’. 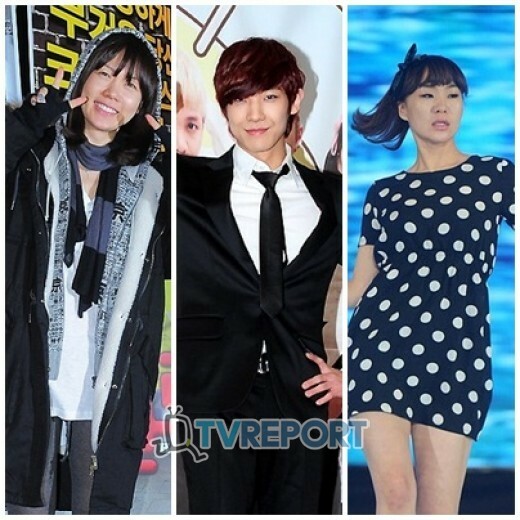 But, Lee Joon has openly revealed that Jung Juri makes him “uncomfortable“. However, after countlessly rejecting Jung Juri, Lee Joon has finally started to enjoy her advances. The first episode of ‘Endless Dream’ aired on March 18. Comments Off on MBLAQ’s Lee Joon & Jung Juri the 1st couple born on ‘Endless Dream’? 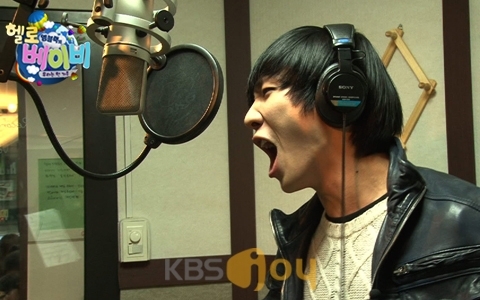 MBLAQ’s Lee Joon showed off his incredible and versatile singing abilities. On the March 15th episode of KBS Joy’s ‘MBLAQ’s Hello Baby‘ the MBLAQ members and their three babies went to the recording studio to record a song for their musical mission. Lee Joon also won a rap battle against his fellow MBLAQ members, earning the right to record the rap portion of the song. He threatened G.O‘s position as the lead vocal after properly pulling off a variety of different music genres including rock, trot, opera, and more. Lee Joon reportedly also caused the staff members to explode into laughter after adding never-before heard documentary-style narrations to the children’s song. Afterwards when they listened to the finished song, Lee Joon said, “This is the first song where my actual voice comes out the most,” and was very pleased with the results. MBLAQ’s Lee Joon revealed his underwear to Ahn Sun Young? MBLAQ‘s Lee Joon and comedian Ahn Sun Young argued over the truth behind Lee Joon’s underwear exposure. Comedian Jung Juri who is known to be a fan of Lee Joon happened to be a witness of the incident and said, “Lee Joon showed me his underwear too,” vouching for Ahn Sun Young. Upon hearing this, female entertainers Lee Kyung Shil and Choi Jung Yoon who were also on set grew extremely envious of both Ahn Sun Young and Jung Juri. The two hilariously remarked that they would definitely like to see his underwear as well. ‘Dreams and Fields’ airs it’s first episode on March 18th at 5PM. Comments Off on MBLAQ’s Lee Joon revealed his underwear to Ahn Sun Young? On a previous episode of MBC TV‘s ’Radio Star‘, MBLAQ‘s Lee Joon remarked that he was losing his taste buds because he ate nothing but kimchi fried rice on a daily basis. But in closing he remarked, “But it’s okay now. We already have no palate so, as long as we’re full, we’re good,” causing everyone on set to continue roaring in laughter. But recently, a reporter from Dispatch spotted a young man in Apgujeong. The man was none other than the ‘Old Boy’ idol himself, Lee Joon. He was also spotted finally eating something other than kimchi fried rice. Lee Joon looked quite happy, thoroughly enjoying a plate of… beef fried rice, and finished it off with a strawberry milk for dessert. Hopefully, this meal was able to help him restore his taste buds and palate.